Try this beautiful home made Ceylon Cinnamon Oil disinfectant for your home, car and work place. The perfect alternative to highly toxic commercial chemical spray that may affect your health. Effective against 26 strains of anti-biotic resistant bacteria. If you have children or pets this is a major issue for many parents. Many of those chemicals cause chemical corrosion even to the bottle they come in. So imagine what it does to all the living breathing people in the house. Time to learn how to make a home made All-Natural Disinfectant Spray with Cinnamon Oil. Both Ceylon Cinnamon Bark Oil and Ceylon Cinnamon Leaf Oil have powerful anti-bacterial properties. If you look at the chart on this page you will see that the Bark Oil is stronger and smells better. But the leaf Oil is much cheaper and therefore more cost effective for everyday disinfecting. Alternatively you can mix the two oils and create an even more powerful disinfectant. 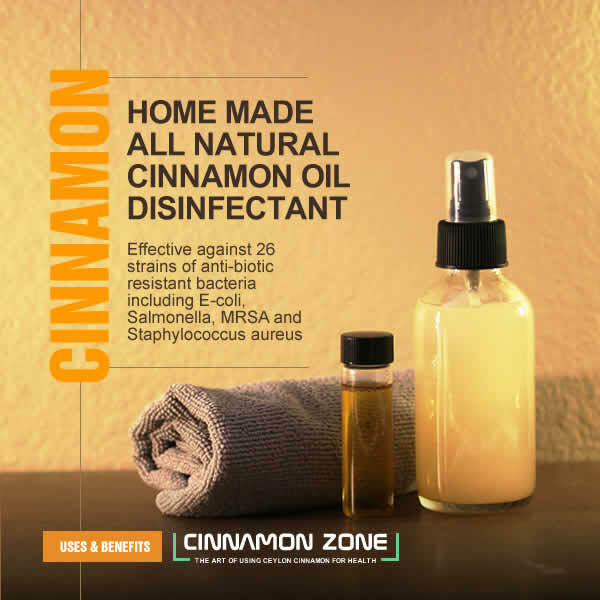 The best thing about Cinnamon Oil is that it works against against most anti-biotic resistant bacteria. First you need a nice robust spray bottle. We prefer a amber 4oz amber glass bottle with atomizer like this. For demonstration purposes we used a clear glass bottle. An amber bottle keeps the oil protected from sunlight and the fine spray atomizer spreads it evenly. Mix as suggested above. If you decide to use only one type of the cinnamon oil just add more of the one oil in the same ratio listed above. For example if you only use Cinnamon leaf oil put in 24 drops and vise versa. Shake bottle well as oil and water does not mix well. It will achieve a white milky look when mixed. Shake before each use as the oil will settle to the bottom very fast. This is a dilution ratio of 1.% Cinnamon Oil to 99% Water approximately. You can go as low as 1% and as high as 2% in the dilution ratio. However remember adding more Cinnamon Oil will irritate your skin. The beauty of Cinnamon Oil is you need very little. Store the cleaner in cool a dark place. Keep away from heat and the sun to prolong shelf life. Shake well prior to each use as the oil will accumulate at the bottom. Use a micro fiber cloth to wipe all surfaces. Tests show that cleaning surfaces with micro fiber cloths or mops eliminates 99% of bacteria, while conventional cleaning tools reduce bacteria by only 33%. And with their superior ability to “grab” dust and debris, cleaning is faster and easier. Safe to use on tile, metal and counter top surfaces. Color test to see if it works on wood and vinyl surfaces without damaging. We have not yet seen any adverse effects of using diluted Cinnamon leaf oil to clean wood or vinyl surfaces. Do not exceed this ratio of 2% as it may cause skin irritation. In either case wear gloves when using any disinfectant including this natural cinnamon disinfectant. May cause a slight skin irritation, very similar to when using alcohol based cleaners. Take precautions and test in a small area before use. It should present no problems to most people. Unlike chemicals cleaners Cinnamon oil is an extremely effective natural disinfectant with no known side effects like cancer. If you apply concentrated Cinnamon leaf oil directly to skin or breath it directly or ingest it, you may experience irritation, a burning sensation, redness, welts, a rapid heart rate, shortness of breath, dizziness, facial flushing, red eyes and nausea. So be careful when dealing the concentrated Cinnamon leaf oil. Do not touch genital areas if you have directly touched concentrated Cinnamon oil even if you have washed your hands as it will cause a burning sensation. Yes we discovered this the hard way. Wear gloves when handling Cinnamon leaf oil. Pregnant and breast feeding women should also avoid using cinnamon in any form. All natural – Can be used on any surface even food preparation surfaces such as cutting boards and inside refrigerators. No side effects other than skin irritation if not diluted properly. Safe for use on 99% of surfaces without staining. Keeps away black ants, mice, cockroaches and many household insects. Anecdotal evidence suggests that Cinnamon improves cognitive (brain) function. Powfull odor neutralizer with excellent scent throw and staying power. Works against most anti-biotic resistant bacteria. We are a group of health advocates who have researched the benefits of Cinnamon especially Ceylon Cinnamon. As the World becomes more dependent on drugs from big Pharma we find that nature has many solutions that are cheaper and more effective to cure and prevent illnesses. You can buy Ceylon Cinnamon from any company. We do not sell Cinnamon. We only provide information.